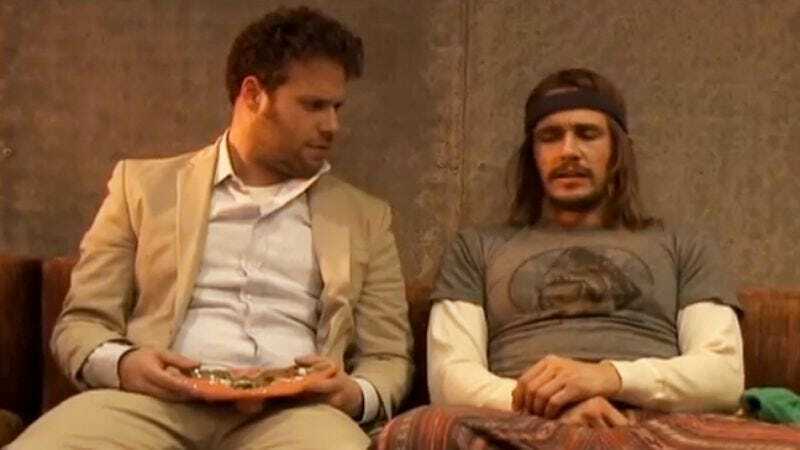 Were it not already patently obvious that today is April Fools’ Day—a traditional holiday during which many a gambol and monkeyshine is undertaken in the name of marketing—here’s a trailer for Pineapple Express 2, which isn’t actually happening. What is happening is that Seth Rogen and James Franco made a movie called This Is The End that’s basically just them and some other guys from Pineapple Express hanging out, then they realized that a good way to sell that might be to make a fake preview where the guys from Pineapple Express hang out, but also pretend that they’re making a sequel. Anyway, Jonah Hill does a Woody Harrelson impersonation, all the stars of the movie lie in a big pile and get stoned, and nothing about this is to be taken seriously. Because, you see, it is April Fools’ Day! Promotional jests for all!